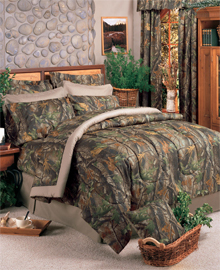 Camo comforter sets in twin, full, queen and king sizes. These camo comforters are available with matching camo sheets, bedskirt, decorative camo pillows and window treatments which include camo valances and camo curtains. For the avid hunter or outdoor lover we have a large selection of camo patterns which make up these camouflage bedding sets. Patterns include Realtree, Advantage, Break Up, Obsession, Treestand, Oak, Timber and many more. We haven't forgotten the kids with pink camo bedding for the girls and blue camo bedding for the boys. These contemporary and modern comforter and duvet cover bedding sets give a crisp, clean contemporary look while adding a sense of style to any bedroom. Many great modern offerings from reversible duvet covers, pillow shams, accent pillows, beskirts and matching bed sheet sets. 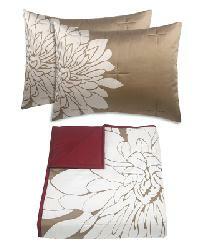 The Comforter Sets also have bedding accessories available to contemporize your modern look. Floral Bedding from budget to luxury are featured in a blossoming array of duvet cover sets to a beautiful bouquet of comforters and coverlets. The flowering wonderfulness found in these floral bedding sets are offered at discount prices so you can enjoy that flower fresh look in your bedroom's bedding. 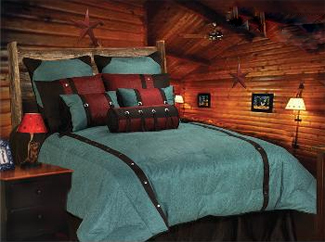 Whether you are decorating for a cowboy, your winter cabin or wanting to bring a touch of the outdoors in, these budget friendly comforter sets will give you that rustic lodge feel. Optional coordinating western look curtains, valance, throw blanket, accent pillows and bed sheets are available. The luxury bedding collection includes duvet cover sets and comforter sets for the more discriminating designer in a great mix of styles and colors. This offering highlights the more luxurious higher end bedding that is offered. The Tropical bedding collection includes duvet covers and comforter sets with a tropical motif. Bring a Hawaiian feel to your beach home or any bedroom that needs a little lift! This tropical bedding offering features a great mix of colors and styles from which to choose.